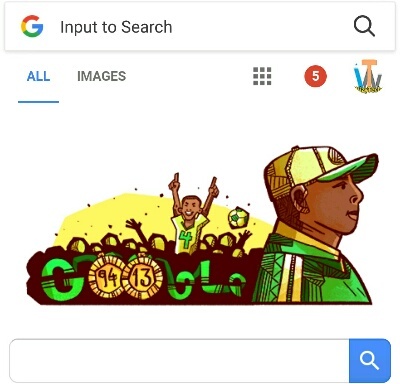 Today is the birthday of Nigerian football legend Stephen Okechukwu Keshi and the number one online company in the world - Google is celebrating the late superstar with an amazing doodle. If you have been observant, Google usually changes its doodle symbol with important memories, days, or people in the world. For instance, during the Christmas period, you will notice the Google doodle change to Christmas tree 🎄 and other symbols of Christmas. Same thing happened when Donald Trump won the US presidential sit. Also when Michael Jackson died, Google celebrated him. Back here in Nigeria, Google has celebrated the likes of Prof Wole Soyinka, Chinua Achebe as individuals. Also celebrated is important days in Nigeria like October 1 and arm forces remembrance day. Today, Google doodle is honoring famous Nigerian football player and coach Stephen Keshi with a nice creative doodle as you can see from the picture. According to Wikipedia, Stephen Okechukwu Keshi was a Nigerian football defender and manager. During his playing career, Keshi earned 60 caps for the Nigerian national football team, making him the nation's second-most capped player at the time of his retirement. SEE ALSO: How Google Celebrated Olympics Games. 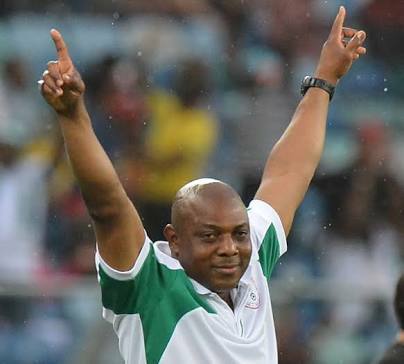 As a manager, Keshi achieved success by qualifying Togo for the only FIFA World Cup appearance in its history in 2006. However, he left the position prior to the tournament and was replaced by Otto Pfister. He later coached his native Nigeria, where he became one of only two people, along with Egypt's Mahmoud El-Gohary, to have won the Africa Cup of Nations as both a player and a coach. You can read more of his biography at Wikipedia. And to the great Coach.